There are a lot of scare stories in the media and on the internet about dairy foods. Concerns have been raised about hormones increasing the risk of cancer and about antibiotic resistance. Hormones are used in some countries to stimulate higher milk yields, but this is not allowed in the EU/UK. Hormones may be prescribed for individual cows for reproductive issues or antibiotics for disease. However the law places very stringent controls on the use of veterinary medicines. When hormones or antibiotics are used, the cow’s milk is not allowed to enter the food chain for a set period, known as the withdrawal period. In my view this is unlikely to change post-Brexit, as these sorts of EU regulations will probably just be adopted as UK law. However I will keep you posted. There are people who cannot consume dairy products because of allergy or intolerance. Some people are allergic to the protein in milk and others have an intolerance to the carbohydrate lactose that is present in milk. But how many people does this actually affect and does it mean that they must exclude dairy products from their diets? Cow’s milk allergy affects around 3-6% of babies and young children but most will grow out of it by the age of 5. Cow’s milk allergy in older children and adults is very rare. If you have cow’s milk protein allergy you need to avoid all dairy products. It is tricky to diagnose cow’s milk allergy as symptoms can be vague and may be attributed to other things. Cow’s milk should be introduced after 6 months of age and separately from other foods that babies can be allergic to i.e. eggs, wheat, gluten, nuts, peanuts (ground to avoid choking risk), seeds, fish and shellfish. A red itchy rash around your baby’s mouth, facial swelling, red itchy lumps on the body, streaming nose, vomiting, or diarrhoea, may indicate cow’s milk allergy. If these symptoms come on very quickly after you have given your baby cow’s milk then it’s easier to make the link but symptoms can be delayed. If you notice these things you should always talk to your GP who will want to rule out other causes. If cow’s milk allergy is diagnosed you should see a paediatric allergy specialist and a Dietitian. You will be monitored and supported to ensure that your child has a nutritionally adequate diet, stays safe and does not avoid cow’s milk for longer than is necessary. 70% of the world’s adult population is genetically programmed to be lactose intolerant. These people start to produce less lactase after weaning. Lactase is the enzyme required to digest the milk sugar lactose. Some population groups have mutations which stop this reduction in lactase production. This is why lactose intolerance is rare in people of northern European decent. Lactose intolerance is most common in African, Asian and South American populations. Intolerance can cause bloating, abdominal pain, nausea, vomiting and diarrhoea. If you think you have lactose intolerance you should talk to your GP to rule out other causes. 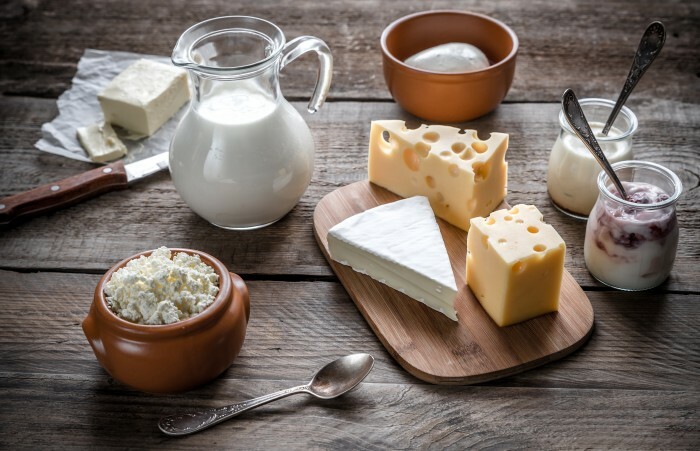 People with lactose intolerance can usually cope with small amounts of lactose in dairy products such as cottage cheese, hard cheese and yogurt. You can also buy lactose free and low lactose milks. If these are not tolerated calcium fortified alternatives should be used such as soya, oat, rice or hemp milk. So dairy foods are only dangerous for a very small proportion of the population who have an allergy to cow’s milk protein. People with lactose intolerance can still enjoy some dairy products but just need to take care not to overload their system. For the rest of us dairy products are safe and nutritious. This is important because dairy foods are the best source of calcium. Most of the calcium we eat is used to keep our bones and teeth strong. Calcium is also important for activating enzymes, blood clotting, muscle contraction, nerve function and maintaining a regular heartbeat. Other foods do contain calcium but it’s much more difficult to get adequate, readily absorbed calcium without resorting to supplements if you don’t eat any dairy foods. The best way to make sure you are getting enough calcium is to have 3 portions of dairy foods/day eg milk with cereal, a glass of milk to drink, a matchbox sized piece of cheese or a yogurt. Remember that low fat dairy products contain just as much calcium as full fat. If you don’t eat dairy for example if you are vegan or if you cannot tolerate it make sure that the substitutes you use have calcium added. Dairy foods are also a great source of protein. Protein is necessary for growth, renewal of cells and repair of tissues. Amino acids, the building blocks of protein, can be made by the body or obtained from food. There are 20 different amino acids in the food we eat, but our body can only make 11 of them. The remaining 9 are described as “essential” amino acids (EAAs) because we have to get them from food. Milk supplies all 9 essential amino acids in suitable proportions and so it is referred to as a high quality protein food. In terms of vitamins and minerals just one 200ml glass of milk would supply about a quarter of our vitamin D, vitamin B2 and phosphorous requirements. Milk is also a reasonable source of vitamin A, vitamin B1 and B6, selenium, zinc and magnesium. As regards whether you choose skimmed, semi-skimmed or full fat it depends on your needs. If you have a lot of full fat dairy foods you will be clocking up the calories and this could lead to weight gain. On the other hand you will be getting the benefit of the fat-soluble vitamins A, D, E and K. These vitamins are of course found in plenty of other foods so if you have small amounts of dairy then full fat is fine. However if you use a lot you need to be wary of the calories and opt for low fat choices. Studies have shown conflicting results in relation to the impact of full fat milk consumption on the risk of heart disease, stroke and diabetes. Cows that are fed grass produce milk with much more healthy omega 3 fatty acids than grain fed cattle so think about where your milk and dairy foods come from as well the type you choose. The Scientific Advisory Committee on Nutrition is currently carrying out a thorough review of all the research evidence relating to diet and saturated fat and it will be interesting to see what the recommendation are in relation to the saturated fat in milk and dairy products. As always I will keep you posted. All in all dairy foods are pretty marvellous and for most people not at all dangerous. Enjoy them as part of a balanced diet. This entry was posted in Balanced diet, Dairy foods and tagged balanced diet, bones, calcium, cancer, diabetes, diary foods, heart disease, stroke by Stephanie.fade. Bookmark the permalink.